St. Apollonia, patron saint of tooth pain. 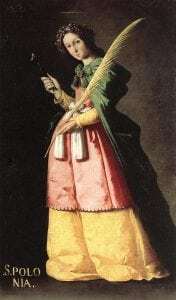 Francisco de Zurbaran, 1636. The 9th of February is St. Apollonia’s Day and, in the U.S., National Toothache Day. 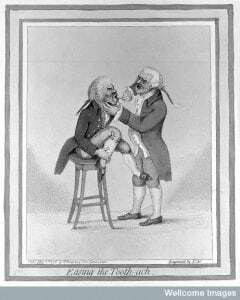 So I offer you tooth-worms, which–as Nicolas Andry described them in An account of the breeding of worms in human bodies (1701)—“occasion a deaf Pain mix’d with an itching in the teeth; they insensibly consume the Teeth, and cause a hideous Stink” (85). On 3 July 1700, John Chamberlayne wrote to Hans Sloane on the matter of his own tooth worms. Now, these men were not people with particularly weird ideas, even for the time. Rather, the idea that toothaches were caused by worms had been around for a very long time. For a good overview of this verminous history, you should read Lindsey Fitzharris’ post on “The Battle of the Tooth Worm”. This idea was still widely held in the late seventeenth century, even by the intellectual elite. For example, at a Royal Society meeting on 18 July 1678, Robert Hooke compared a growth within a tree trunk to tooth rot. At this point, Society members digressed into discussions of worms causing rot and the removal of tooth worms. In one case, a woman extracted the worms with a sharpened quill; in other cases, “the same thing was done by the help of the fumes of henbane seeds taken into the mouth; whereby the saliva falling into a basin of water held underneath, would discover several living worms, supposed to issue either from the gums or teeth”. Old knowledge could even, seemingly, be supported by investigations using new technologies. In a letter published in the Philosophical Transactions of the Royal Society in 1684, Anton van Leewenhoek described his microscopical observations “about Animals in the Scurf of the Teeth”. Leeuwenhoek started with his own teeth, “kept usually clean”. He examined other samples of tooth plaque from two women, an eight-year old and two old men.Using his microscope, he discovered several sorts of creatures, some like worms, in the plaque—so many that “they exceed the number of Men in a kingdom”. These creatures, though, were present in sound, healthy teeth. Could these be tooth worms? Leeuwenhoek was not so convinced by 1700 when two of his letters “concerning Worms Pretended to be Taken from the Teeth” was published in the Phil. Trans. He had examined two worms “taken out of a corrupt Tooth by smoaking”, one of which was still alive after four days in the post (sent on 4 July 1700). Leeuwenhoek believed it came from the egg of a type of fly that laid their eggs in cheese. He rounded up more worms from his local friendly cheesemonger and ran several experiments (including watching the worms copulate). had some time before eaten Cheese laden with young Worms, or Eggs of the above-mention’d Flies, and that these Worms or Eggs were not touch’d or injur’d in the chewing of the Cheese, but stuck in the hollow Teeth. Gnawing worms had caused the tooth pain. Or did they? For his work on bodily worms, Andry had also examined some worms “that a Tooth-Drawer took off of a Lady’s Teeth in cleaning them”. Based on this case, Andry concluded that tooth worms rotted the teeth, but did not cause any pain. These small, long and slender worms with round black heads bred “under a Crust that covers the Surface of the Teeth when they’re disorder’d” (38). To the modern reader, Leeuwenhoek’s argument is more sensible. Sure, there might be microscopic creatures living on the teeth, but they were not the same as the so-called tooth worms… which were really more cheese worms than anything. But at the time, Andry’s version would have been compelling. Worms were thought to breed in unclean conditions and, as Andry made clear, they could breed under a crust on an unhealthy tooth: it was the disorder in the tooth, not the worm, that caused the pain. James Gillray’s, ‘Easing the Tooth-ach’, 1796. Credit: Wellcome Library, London. When John Chamberlayne, Fellow of the Royal Society, wrote to Sloane about his own tooth-worms, he did so in the interest of advancing knowledge and reporting on an efficacious treatment. He did not ask for Sloane’s advice, but instead reported on his visit to Mr. Upton, known for his “tooth-candling” expertise. Using heat and smoke, Upton removed rheum from Chamberlayne’s gums and extracted ten or twelve worms. This was apparently on the low side, since Upton on a really good day could remove sixty worms. Chamberlayne claimed that he ordinarily had no faith in men such as Upton (meaning: irregular practitioners, sometimes known as quacks), but many gentlemen of his acquaintance had attested to the success of Upton’s treatment. Of course, given that Chamberlayne also described his teeth as “loose and corrupted”, he may also have been willing to try anything for what must have been terrible pain! Chamberlayne was familiar with the wider discussions about bodily worms, referring, for example, to Leeuwenhoek’s 1684 article in the Phil. Trans. Besides the report, Chamberlayne may have taken a chance to do his bit for knowledge in another way: he may have sent Sloane some tooth worms. Is it just coincidence that Chamberlayne’s letter to Sloane was dated 3 July 1700 and that Leeuwenhoek referred to worm specimens sent on 4 July 1700? Whatever the case, one moral of the story is: choose your cheese wisely if you have bad teeth. Thomas Birch, The History of the Royal Society of London, vol. 3 (1757): 428.